Ladislas Farago (1906)...Book "Patton: Ordeal And Triumph"
Omar N. Bradley (1893)...Book "A Soldier's Story"
George C. Scott (1927) as Gen. George S. Patton Jr.
Il nous faut de l'audace, et encore de l'audace, et toujours de l'audace was an axiom attributed to one of the bold leaders of the French Revolution, Georges Jacques Danton. It translates in English, we must dare, and again dare, and forever dare. Though it is incorrectly attributed to Friedrich the Great in the epic film Patton, it best describes the flamboyant and turbulent nature of the general whose military exploits was being depicted. 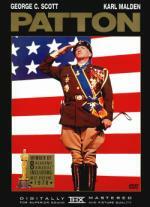 George S. Patton came from a respected lineage of American warriors. His grandfather had served in the Confederate army with distinction, as did many other members of his ancestry. His upbringing was filled with stories of the great military leaders of history and this naturally set in his mind the desire to emulate them. After graduating from West Point, he got his first taste of battle at Saint-Mihiel in World War I. When the war ended, he would languish as all other career soldiers would, in the depleted peacetime army. His life would re-awaken with the attack on Pearl Harbor and the United States entry into World War II. It is here that the film begins, as the first battle fought by the U.S. Army is a resounding defeat at the Kasserine Pass at the hands of the Desert Fox, Erwin Rommel. As a result, Patton is given his first command as leader of the Army’s II Corp and would hand a defeat to the Germans at El Guettar. From there he would land in Sicily as part of a two-pronged attack by the Allies against the combined German and Italian armies. Patton’s Sicilian campaign is best remembered for two events that would alter the planning of the impending assault at Normandy the following year. First, after successfully taking Palermo through the use of end-run assaults and his own version of ‘blitzkrieg’ tactics, he took the pivotal town of Messina ahead of his rival, General Bernard Law Montgomery. His ability to maneuver and bewilder his adversary, thus gaining ground on the retreating enemy, would serve him best in France at the head of ‘Operation Cobra’, the breakout assault that destroyed the Germans will to fight in 1944. The second event would have a more detrimental effect on his career. While visiting a hospital, he struck two enlisted men who were being treated for ‘battle fatigue’, an illness that Patton saw as an excuse for cowardice. The fallout from this incident would create a logistical problem for Allied Supreme leader Dwight D. Eisenhower. Patton’s military abilities were being counted on for the invasion of ‘Fortress Europe’, but with the furor over this incident, he now was contemplating sending Patton home. When Eisenhower learned through ‘Enigma’ codes that the Nazi’s were expecting Patton to lead the invasion, it was decided to build a fictitious army for Patton ‘to lead’ in an invasion of Calais, where the Nazi’s believed the invasion would take place. It was in this role that Patton would serve his army best, as the diversion of key panzer divisions to Calais allowed the Allies to grasp a foothold on Normandy. The film, as a whole, is a topnotch treatment of a soldier’s legacy in the Second World War. We see Patton, warts and all in this detailed depiction of a 20th century anachronism, the ultimate warrior. The only problem I had with the film and the reason I’m only giving it four stars, is its depiction of Patton’s prime rival for the glory of victory, General Montgomery. Portraying Montgomery as a whiny prima donna is an insult to the legacy of a very competent and skillful field general. While they were both insatiably driven in their efforts to garner the accolades of the press and their countrymen, without Montgomery’s efforts, I don’t believe the Allies would have found victory quite so easily.